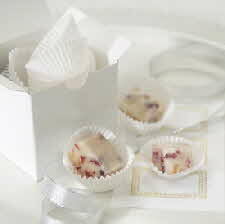 The natural caramelized flavor in CARNATION® rounds out the delicate taste of this white fudge. Combine sugar and ground ginger in medium, heavy-duty saucepan. Add evaporated milk and butter. Bring to a full rolling boil over medium heat, stirring constantly. Boil, stirring constantly, for 4 to 5 minutes (to 234° F). Stir in marshmallows, morsels, cranberries and crystallized ginger. Stir vigorously for 1 minute or until marshmallows are melted. Pour into prepared pan; refrigerate until firm, about 1 1/2 hours. Lift from pan; remove foil. Cut into pieces. Cooking Tip: Crystallized ginger can be found in the spice aisle of the grocery store.